24 hours of unscripted entertainment, including a musical, a seance, and a trilingual set, to support Bad Dog Theatre Company's diversity programming. 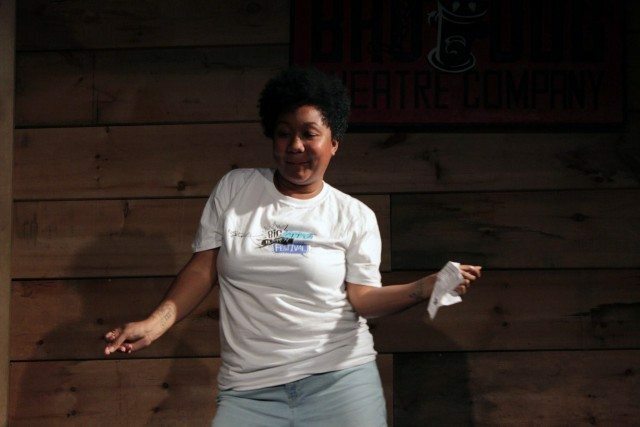 Coko Galore is one of eight core performers taking part in 24 Hours of Improv, starting tonight, with dozens of special guests. Photo by Justine Cargo. Busy unscripted entertainment company Bad Dog Theatre does a lot with very little, as improv isn’t usually a money making enterprise for performers. Despite their low bottom line (or perhaps because they’re so grassroots), they’ve been putting a lot of effort into a drive to diversify the students in their classes and performers on their stages. Tonight’s 24 Hours of Improv marathon, which is raising funds for their diversity program, will feature eight core performers participating for the duration, plus special round the clock editions of much of Bad Dog’s programming, including Kinsey Fail (a LGBTQ+ friendly format) and Songbuster (the improvised musical). Also scheduled: more unusual shows like Becky Johnson‘s 3 a.m. seance, and a show that’ll be performed in French and Spanish. Entry to shows, which happen on the hour, every hour, is set at $15 for p.m. shows, and $10 for a.m. ones; $80 gets you all access. Friday, March 10, 7 p.m. – Saturday March 11, 7 p.m., Bad Dog Theatre (875 Bloor Street West, 2nd floor), $10-$!5 per show, $80 24 hour pass. Urban Planner is your curated guide to what’s on in Toronto—things that are local, affordable, and exceptional.